This antique Conoco sign is a yellow circle. 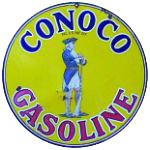 “Conoco Gasoline” is printed in blue and red text on the circle. The center of the circle features the picture of a Revolutionary era soldier standing, and facing away from the viewer.